Welcome to SoCreaStitch, the French stitching touch! 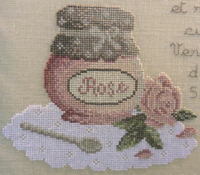 This is a French website which was created for the British stitchers' community. So you shop in sterling pounds without worrying about language issues (all instructions are translated in English) or delivery cost, which is fixed whatever you order: only £3. Click here for further details regarding North America. Click here for further details regarding other regions of the world. We provide a friendly and efficient service, check our customers' testimonials. We have decided to celebrate the arrival of summer with this new kit based on French designer Zaza Picque's gorgeous design Lettre Rose. It has all what we like for a relaxing stitching session: pre-sorted threads, limited number of charming colours, reasonable size that will allow to take it with you wherever you go on holiday and the pleasure to see it developing quite quickly. If you'd like to work it in you own colour scheme and/or on your favourite fabric, the pattern also exists as a chart. Looking for other flowery patterns? Check our "Flowers & Gardens" collection. For everything connected to summer, it's here! Atelier Couture in Cross Stitch Crazy magazine! 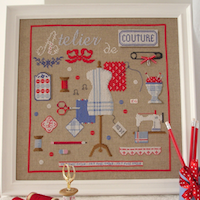 We are very pleased to let you know that Atelier Couture, by French designer Passion Bonheur, is currently featured in Cross Stitch Crazy magazine, issue 203, just released in Great Britain! Passion Bonheur particularly likes to design patterns relating to fashion: see for instance Haute Couture (red shades) or Madame (pink shades). As many of us, she also enjoys all things related to needlework in general and, if this is your case too, don't miss our special selection of French charts and embellishments gathered in our dedicated collection: A Stitcher's Life. 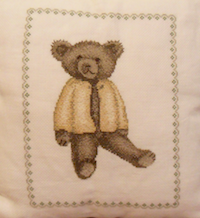 From now on, this classic Teddy Bear designed by French designer Le Lin d'Isabelle is available as a kit (Linen or Aida fabric). If you like teddy bears in general, have a look at our collection of cross-stitch teddy bears for cute charts at a very soft price. And of course, for other charts related to babies or children, check our Babies & Birth Samplers collection and our Kids & Teens collection. All these collections show designs for boys or girls and also some neutral patterns. With Valentine's Day not so far away, here is an inspiring design by Tralala: l'Arbre aux Coeurs (The Heart Tree). This could also be a cute little present for a wedding. It is such a nice reminder that love is like a plant and should be taken care of to grow and flourish! For more designs featuring hearts or related to the wedding theme, do not forget to browse our Heart and Wedding section here. Discounted price on lovely embellishments! There is an exceptional event going on here at SoCreaStitch! 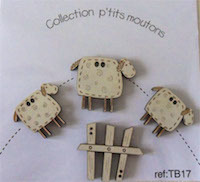 We've decided to put some lovely wooden embellishments on sale! These cute little pieces can be attached on all sort of works: small quilted panels, surface embroidery works, cross-stitch projets, etc. You can even use the small drawing on which there are presented for inspiration. All the products on sale are here! This sale is now closed. To be informed of our special events, subscribe to our newsletter (see top right). Ring Pillow by Le Lin d'Isabelle featured in Cross-Stitch Crazy! 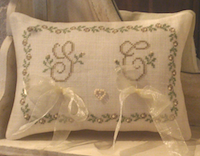 The British magazine Cross-Stitch Crazy has selected one of our kits for a reader who was looking for a "traditional yet stylish" ring pillow for her niece's wedding! You can read the small article featuring this design by Le Lin d'Isabelle in the February issue (currently on sale in the UK). You can find the complete kit by SoCreaStitch here (just specify the fabric in the comment box during the check-out: 32 count linen or Aida in linen). To browse all the gorgeous, stylish patterns by Le Lin d'Isabelle, click here. Looking for an elegant, romantic yet modern design to offer or to adorn your home? Don't look any further! Madame La Fée has released another of her treasures: Bienvenue Chez Nous (Welcome to our Place). With its winter shades warmed up by vibrant reds and pinks, it truly evokes a cosy, friendly home. We just love the pretty stripe that imitates patchwork as well as the gorgeous basket of flowers. After the Indian summer we enjoyed here in France and in some parts of England, Autumn and its rich colours are settling in. Will the winter be mild? Will we see snow this year? If you're fond of patterns that evoke mountains and/or snowy evenings by the fire, you should check our selection of Alice & Co designs, particularly her Heart Collections (Coeurs Rouges, Coeur Flocon, etc.). 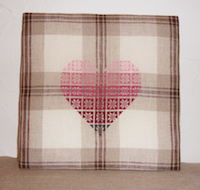 We love them because they are traditional and quite modern at the same time and so easy to stitch. 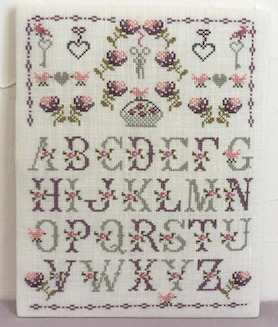 This week, we propose one of them as a kit with the very same fabric used by Alice & Co when she designed the pattern. We just love the stunning outcome on this original linen fabric. This Snowflake Heart Kit is available here. It happens each and every year: there is either a particular Christmas pattern that we've promised ourselves to finish by THIS Christmas, or a new one that we feel compelled to begin (or at least to add to our to-be-stitched-one-day-treasures). Well, don't wait till Christmas to indulge yourself! Browse our Christmas selection and find the perfect design. 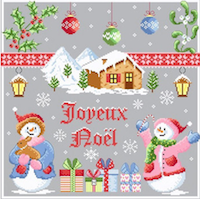 Many new designs hit our shelves recently, including this joyful Joyeux Noël à la Neige (Merry Christmas under the Snow) by Passion Bonheur. Here are two sweet designs by Le Lin d'Isabelle: this lovely Confit de Rose (Rose Jelly) and its sister chart Confit de Violette (Violet Jelly). Both designs are in fact the recipe (only in French I'm afraid!) of home-made jelly with petals of rose and violet. You can either stitch the whole design with the text of the recipe or only the drawing part with the pot (approx. 15 x 13 cm). It will look so lovely framed to decorate the kitchen or appliquéd on the cover of a recipe book. Feeling down because of the rain? Here is a design by Tralala that is bound to cheer you up with its subdued colours and lovely motifs. It's also a good opportunity to check our selection of sheep-related designs or the other animal-related designs that we stock! Let's have a lovely cup of tea! Gorgeous new Indian design by Passion Bonheur!